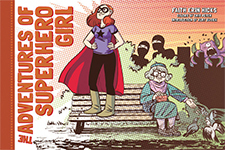 Originally serialized in The Coast paper, The Adventures of Superhero Girl has since been published in its entirety online and is available to purchase in a full-colour, hardcover edition from Dark Horse. Born in the wilds of British Columbia, home-schooled in Ontario and now living beside the other ocean in Halifax, Nova Scotia. She worked in animation for a bit, and now draws comics full time. She's not sure how that happened either. Format: FC, 112 pages; HC, 10 13/16" x 6 5/8"
Order today at your local comic book store or book buying place of choice! "Hicks infuses [The Adventures of Superhero Girl] with an easy charm, plus a healthy dose of ninjgas and monsters from outer space." "Hicks excels at depicting adolescent emotion and the way feelings ricochet off the actions and reactions of others." 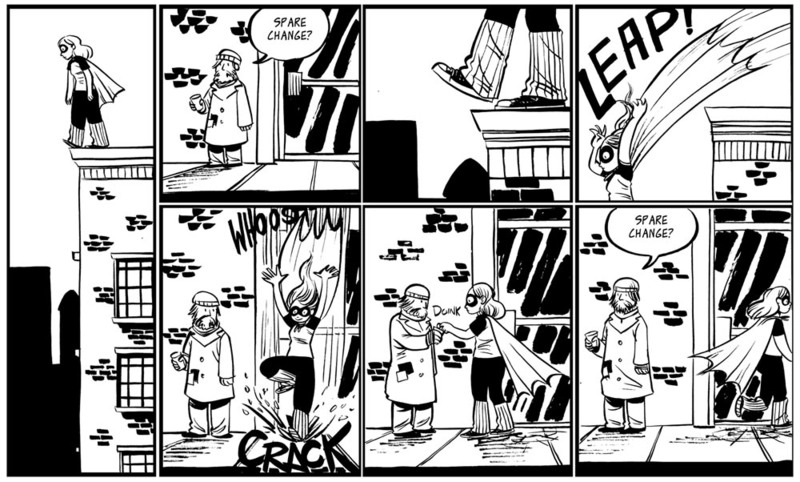 The Adventures of Superhero Girl © Faith Erin Hicks, Dark Horse Comics, 2014. Nothing on this site may be used or reproduced without permission.